I'm photographing an Steampunk-themed event in June of this year. I would like to get in on the fun by putting together a Steampunk-style costume. My immediate thought was a set of spongebag trousers would be ideal but those are hard to find. So I was wondering if I could put together a reasonable Steampunk costume whilst still remaining respectful of the kilt and the heritage it represents. My idea was to wear black Oxfords, probably some brighter hose (Mustard or Denim), darker flashes, my kilt, a plain black day sporran (perhaps with an aged-finish decorative gear-gadget affixed to the flap or front with removable, leather-safe adhesive, a charcoal waistcoat, pocket watch with gear fob, and gingham shirt. I might or might not wear a tie (if I do, I'd probably complement or match the flashes). I also have a steampunk-looking double-glass loupe that clips on to my eyeglass frames (that I actually use in my mundane life for soldering and component assembly). Thoughts? Mine are that it should be no less respectful than any other fantasy costume but I could be totally off-base here. I'm the wrong person to answer the "respectful" question. But for something with a Steampunk theme, a pith helmet would probably work for a hat. Alternatively, you could wear a Balmoral or Glengarry, while replacing the standard badge with something more Steampunk themed. If this were an outdoor event, I would (a) order a Fawn Balmoral and (b) make a steampunk-ish cap badge. But this event is indoors so no headwear necessary or desired. The city of Victoria has a huge Steampunk group and an annual gathering. My wife and I have attended in appropriate costume. I feel that the headwear indoors question is moot if in costume. Top hats and pith helmets seem to be the go to for steam punk. With gears glued to them. “a genre of science fiction that has a historical setting and typically features steam-powered machinery rather than advanced technology. "if you like steampunk, this is a great book for you"
The will smith version of Wild Wild West would be considered steampunk. Giant, steam-powered, mechanical spiders and whatnot. Last edited by FossilHunter; 14th April 19 at 08:52 PM. Sounds like a fun event, however I don't like to think of a kilt as a costume. Now, Utilikilts and Sportkilts are a different matter. 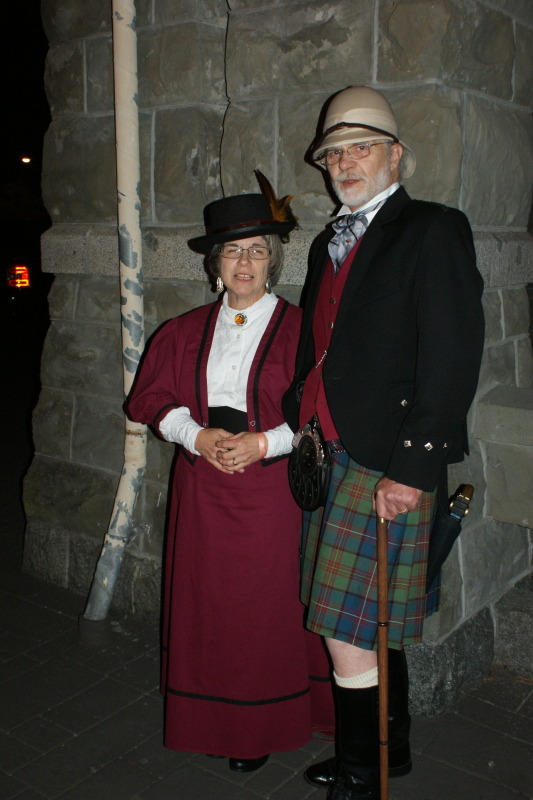 The thing I notice is that Steampunk kiltwearers nearly always wear anachronistic Highland Dress items with their Steampunk. Because Steampunk, as it's been explained to me, exists in a specific time period, namely the Victorian period. Since Highland Dress underwent a near-total transformation around WWI these anachronisms are quite clear. And it gets even more anachronistic, because Utilikilts are often seen in Steampunk, off by a century. Seems that nearly all men in Highland Dress at Victorian Balls, Dickens Festivals, American Civil War Balls, etc wear 20th century Highland Dress items, especially sporrans and jackets. Last edited by OC Richard; 15th April 19 at 06:36 PM. Steampunk does not have to be limited to the historical Victorian period at all. It is science fantasy with the premise that the technology of steam and mechanical contraptions of the industrial revolution are still pre-eminent today. That the art and aesthetic of the steam era are as much a part of today as we would wish they could be. So a blending of cast iron, Brass, and the intricate art of the Victorian period used to make computers. What if airships still ruled the skies and steam locomotives still crossed continents, What if Disney's version of Jules Verne were true. Atomic powered submarines that look like this. That the wonder of that Victorian unknown world still lay before us and the industrial revolution and our new understanding of technology is making it all possible. Would not the renown Scottish Engineers still be in the forefront? Last edited by Steve Ashton; 15th April 19 at 11:49 PM.